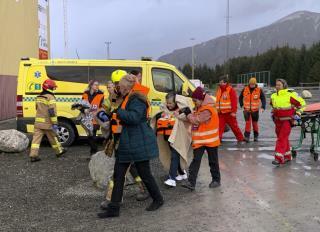 (Newser) – Rescue workers off Norway's western coast rushed to evacuate 1,300 passengers and crew from a disabled cruise ship by helicopter on Saturday, winching them one-by-one to safety as heaving waves tossed the ship from side to side and high winds battered the operation, the AP reports. The Norwegian newspaper VG said the Viking Sky cruise ship issued a mayday call as bad weather hit Saturday and engine problems caused it to start drifting toward the rocky shore. Police in the western county of Moere og Romsdal said the crew, fearing the ship would run aground, managed to anchor in Hustadsvika Bay, between the Norwegian cities of Alesund and Trondheim, so the evacuations could take place. Rescue teams with helicopters and boats were sent to evacuate the cruise ship under extremely difficult circumstances. Norwegian media reported gusts up to 43 mph and waves over 26 feet in an area known for its rough, frigid waters. The majority of the cruise ship passengers were reportedly British and American tourists. By 6pm, some 100 people had been rescued and were being taken to a nearby sports hall. Video and photos from people on the ship showed it heaving, with chairs and other furniture dangerously rolling from side to side. Passengers were suited up in orange life vests but the waves broke some ship windows and cold water flowed over the feet of some passengers. "I was afraid. I've never experienced anything so scary," Janet Jacob, among the first group of passengers evacuated to the nearby town of Molde. American passenger John Curry said "it was just chaos. The helicopter ride from the ship to shore I would rather not think about." 43 mph is so much worse than 40. Norwegian Coast Guard, what is your emergency? We need 1300 sea sick people lifted off a boat! Helo probably needed an oil change mid way. Poor people paid to be this miserable.